World's top3 motherboard manufacturer, ASRock Inc, unveils its latest Intel® 7-series motherboard at 2012 Annual Global Tour. The latest 7-Series motherboard supports 2nd and 3rd Generation Intel® Core i7 / i5 / i3 Processors. Featuring unique XFast 555 technology (XFast RAM, XFast LAN, XFast USB), ASRock 7-Series motherboard allows users to experience "REAL" performance boost (up to 5X better) in terms of PC's overall performance, LAN speed and USB transfer speed. ASRock has built up a reputation for building bulletproof mobos with very competitive price tag. In 2012 Global Tour, ASRock will be showcasing the long-awaited motherboards based on Intel® 7-series chipsets. ASRock endeavors in delivering the most trusted motherboard products and most convenient software kits to users. All the innovative features of XFast 555 Technology are not specialties for the latest motherboards but can be implied on all series of ASRock motherboards. ASRock 7-series motherboard support Lucid Virtu Universal MVP technology that improves your PC's visuals, with faster response times, improved video processing and smoother media playback, all with low power consumption. Brilliantly designed for gaming, Virtu Universal MVP™ switchable graphics software assigns tasks dynamically to the best graphics resource and features new exciting techniques. HyperFormance™ combines integrated and discrete graphics for uncompromised performance and improves gaming rate 30-70%! Virtual Vsync™ solves the ever lasting debate between quality and performance. It even brings GPU performance from 60 FPS Vsync limit back to its maximum while keeping Vsync image quality and no tearing. When it comes to overclocking, functionality is everything. ASRock Z77 Extreme9 is a very powerful, future-proofed, highly overclockable machine and has the most overclockable configurations. For memory aspect, Z77 Extreme9 mobo breaks the memory overclocking barrier and pushes it up to DDR3 3000+ (OC) MHz! Moreover, this board is unprecedentedly equipped with PLX PEX 8747 bridge which is able to run dual VGA cards (2-Way SLI / CrossFireX) at PCIe Gen3 x16 / x16 mode or four VGA cards (4-Way SLI / CrossFireX) at PCIe Gen3 x8 / x8 / x8 / x8 mode. In addition, ASRock Z77 Extreme9 comes with an exclusive WiFi 802.11 b/g/n + BT v4.0 module that offers support for WiFi 802.11 b/g/n connectivity standards and Bluetooth v4.0. The board even bundles with an exclusive Wi-SB Box (with 2 antennas) that offers superior WiFi and Bluetooth signal quality and 2 front USB 3.0 ports. ASRock believe its rich and exciting Z77 Extreme9 package will definitely make geeks swoon! 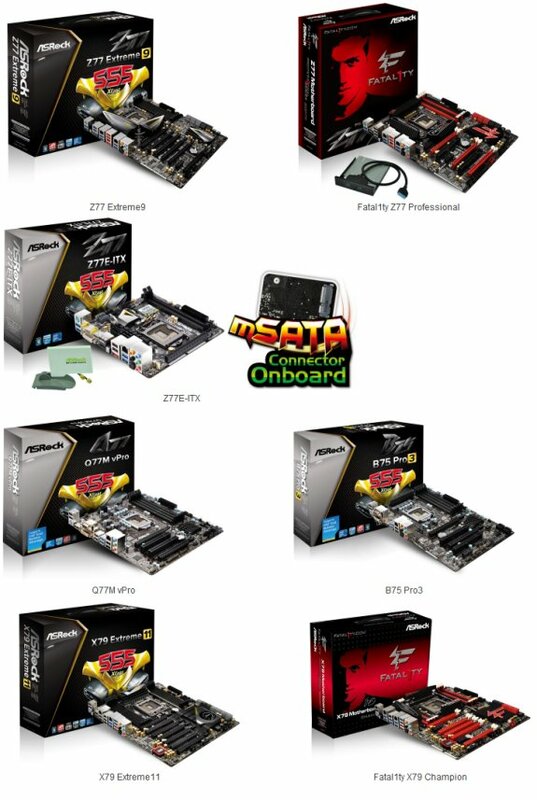 Fatal1ty Z77 Professional is the other high performance board from ASRock – Fatal1ty relationship. ASRock/Fatal1ty Z77 Professional was designed to exceed the expectations of even the most dedicated gamer. With Z77 Professional, 100% precise Fatal1ty Mouse Port technology and all-in-one tuning program F-Stream; you will take your gaming to a whole new level. Small size, huge performance. ASRock Z77E-ITX is a well-built motherboard and packs to the gills with features. There's a remarkable mSATA connector onboard. The mSATA connect can be used to connect a Solid –State Drive (SSD) for an internal storage device. Coupled with SSD and HDD, users are able to take advantage of Intel® Smart Response Technology and enjoy smart caching performance easily. The board also comes with an exclusive WiFi module that supports WiFi 802.11 b/g/n connectivity standards. Users can easily create a wireless environment with ASRock WiFi-supported motherboard. Targeted on the small business market, ASRock will firstly release new mobo products based on Intel's corporate-focused Q77 and B75 express chipsets. ASRock Small Business Motherboard Series help users to add value to their products, monitor and mange their business in a more customizable way. Dedicated to your business, ASRock Q77M vPro motherboard offers plenty software solutions, to name a few, Intel® vPro Technology, Intel® Small Business Advantage, Intel® Smart Connect Technology and Intel® Rapid Start Technology. Intel® vPro™ Technology is a set of IT capabilities, including manageability, security and power management, all embedded into the hardware of PCs with Intel® Core vPro™ processors. The capabilities are built into the hardware, so they are available virtually anytime, even if the OS is inoperable, PC's power is off, or the hard drive has failed. At the top of the ASRock's B75 range is the B75 Pro3. Based on Intel® B75 chipset, the board features several state-of-the-art techniques from industry heavy hitters, such as Intel® Small Business Advantage (SBA), Intel® Smart Connect Technology, Intel® Rapid Start Technology, THX TruStudio™, etc. Intel® SBA provides an easy-to-use interface and relevant security and productivity applications, ensuring customers to obtain the most trusted computing environment. Coupled with a wide range of features, the ASRock B75 Pro3 motherboard will undoubtedly be the best choice of developing your business. In addition to the much-anticipated 7-series new skus, ASRock will be also presenting its latest high-end motherboards based on Intel® X79 chipset. ASRock X79 Extreme11 is a premium motherboard using luxury material, applying high-class specification. The unprecedented X79 Extreme11 was equipped with LSI SAS2308 chip, providing 8 sets of SAS (6 Gb/s) connectors which can be also used for SATA3 standards. Those 8 SATA3 connectors plus native 2 SATA3 from Intel® X79 chipset, the ASRock X79 Extreme11 motherboard totally offers up to 10 sets of SATA3 ports. PC enthusiasts will also appreciate the onboard two PLX PEX 8747 bridges. PLX bridge offers solid PCIe 3.0 lanes and allows this mobo to be the world's 1st motherboard supporting 4-Way SLI and CrossFireX at PCIe Gen3 x16 / x16 / x16 / x16 mode! For audio aspect, top-end X79 Extreme11 mainboard comes with onboard Creative Sound Core3D quad-core sound and voice processor. It offers rock solid sound experience and supports THX TruStudio PRO™ superior technology, CrystalVoice, EAX 1.0 to EAX 5.0 and Scout Mode™, allowing users to enjoy a pure and solid sound experience. Fatal1ty X79 Champion is the world's most powerful gaming kit to date. This board is marked by its versatile solutions. V-Probe™ is a 7-set of detection points, allowing overclockers to easily and quickly get the accurate voltage readings via a multitester. Marvel SE9230 controllers allow users to enjoy the benefits of HyperDuo Plus™ technology. It makes SSD become the cache of the HDD, saves more time on data transmission and provides up to 14 times faster performance than a HDD-only system. You don't need to most expensive motherboard to get serious performance. The newly launched ASRock Intel® 7-Series motherboard brings a bucketful of advanced features, including ASRock exclusive XFast 555 Technology, Lucid Virtu Universal MVP, Intel® Smart Connect Technology and Intel® Rapid Start Technology, etc. If you want better performance, upgradable configuration and professional service, take a look at our range of dedicated motherboards. You'll find perfect mobos to suit every budget and purpose – from great C/P value to feature-rich mainboards.